Yes, it's a book title, it's not a phrase I would generally use in my public space! I spotted this book whilst browsing in Melbourne's Dymocks in the iconic Collins Street … and it reminded me of the idiom ‘you can’t judge a book by its cover’. Would you be inclined to pick this book up off the shelf? And read it? Hell Yeh! I couldn’t wait to read it - I devoured it in one day. The question is ... is it worth reading? The idea of ‘not giving a f*ck’ is a simple way of reorientating our expectations for life and choosing what is important and what is not. This book will help you think a little bit more clearly about what you’re choosing to find important in life and what you’re choosing to find unimportant. Author, Mark Manson, writes about happiness, habits and relationships and doesn’t hold back in his thinking and views in this book. He advocates that true happiness occurs only when you find the problems you enjoy having and enjoy solving. If you want to change how you see your problems, you must change what you value and/or how you measure failure/success. Knowing and living by our values is what Mark advocates. Values like honesty, innovation, vulnerability, standing up for oneself, standing up for others, self-respect, curiosity, charity, humility and creativity. Opposed to bad values which he differentiates as: superstitious, socially destructive, not immediate or controllable e.g. pleasure, material success, always being right and staying positive. It is a self-help book and Self is explored in detail: self-awareness, self-worth and self-improvement. A true measurement of self-worth is not how a person feels about her positive experiences, but rather how she feels about her negative experiences. A person who has high self-worth can look at the negative parts of his character and then acts to improve upon them. Self-improvement is about: prioritising better values, choosing better things to give a f*ck about. Self-awareness is like an onion. The first layer of the onion is understanding one’s emotions “This makes me feel sad.” The second layer is the ability to ask why we feel certain emotions – get to the root cause of the emotions which allows you to do something about it. The third layer is our personal values – why do I consider this to be a failure? By what standard am I judging myself and everyone around me. So where to do you start to seek clarity about 'what you do (and don't) give a f*ck about'? 1. What are we choosing to give a f*ck about? 2. What values are we choosing to base our actions on? 3. What metrics are we choosing to use to measure our life? 4. And are those good choices—good values and good metrics? · Fault is past tense. Responsibility is present tense. · We can be truly successful only at something we’re willing to fail at. If we’re unwilling to fail, then we’re unwilling to succeed. · The more you try to be certain about something, the more uncertain and insecure you will feel. · Keep death in mind at all times in order to appreciate life more and remain humble in the face of its adversities. · Not giving a f*ck does not mean being indifferent; it means being comfortable with being different. Mark Twain said “The fear of death follows from the fear of life. A man who lives fully is prepared to die at any time.” Whilst this is taking it to the extreme, it’s a stark reminder to get to know your life’s purpose and the meaning of your life here on earth. 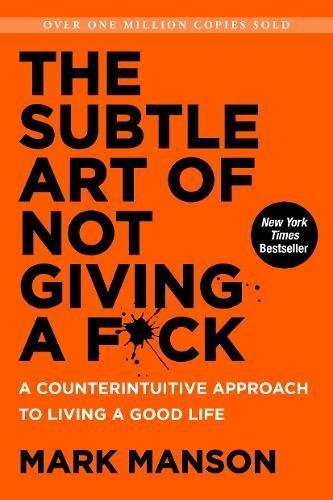 So, before you do die, I suggest you read The Subtle Art Of Not Giving A F*ck. You can order your book here! I am happy to share that I've concluded my reading challenge: 52 books in 52 weeks. It was a mammoth task yet I managed to fulfill all other responsibilities in my life. This particular book was #49 and I've rated it as a must read however it didn't make it into my top five books.